RCC framed structures are nowadays very popular for almost all types building. Slabs, beams, columns and foundations are the key segments of building/house which provides strength to remain undisturbed against different loads and offers strength so that it performs well during their service life. Here we talk about two-way slab. Before understanding the one-way slab or two-way slab, one should understand the slab. The slab is a flat basic component of any building/house which is utilized to develop floors and roofs. It is generally made of reinforced concrete. Slabs are the most widely used structural elements whose thickness is considerably less than their other dimensions. Slabs may have different shapes and support conditions. They can be of solid, ribbed, and waffle types. Depending upon their load carrying behaviour, they are classified as one-way or two-way slabs. The one-way slab is a slab which is supported by parallel walls or beams, and whose length to breadth ratio is equal to or greater than two and it bends only in one direction (spanning direction) while transferring loads to the walls or beams. Read more about the one-way slab. The two-way slab is a slab which is generally supported on all sides of walls or beams, and whose length to breadth ratio is less than two and it twists or bends in both direction while transferring the loads to the walls or beams. The two-way slab will deflect in a dish or saucer-like form under the action of loads. Corners of the two-way slab lift up if the slab is not cast monolithically with the supports (walls/beams). The two-way slab is designed for both the directions as it bends in both directions. Even the slab supported on three edges or two adjacent edges may also be considered as a two-way slab. In that case, loads get divided in the two directions which depend on the ratio of the sides. In two-way slabs, the main bars are provided in both directions, and they are perpendicular to each other. When the corner of simply supported two-way slab is not held down, it will tend to lift off the support and it results into arising of negative moments. Thus, the corner reinforcement (torsional reinforcement) should be provided at a discontinuous edge of the two-way slab. The usual thickness of these slabs is in the range of 100mm to 200mm depending upon span. Two-way slab is suitable and economical for the panel sizes up to 6m x 6m. Minimum depth of two-way slab, most of the times is governed by deflection criteria. Sometimes the minimum depth may be adequate as per flexure design, but if deflection criteria is not fulfilled such slabs will came vibration even an small loads like walking, jumping etc. Hence even you design checks may give you less depth, always check for deflection. Here you can provide marginally large depth and can reduce steel to economize. Please note that the vibrations not give a feeling of safe building to occupants. The choice between these different two-way slab systems is made based on the architectural, structural (amount of the design loads, span lengths, and provided lateral load-resisting systems), and construction considerations. Also Read: What are the Building Structural Systems? There are mainly three types of designs for two-way slab. In two-way solid slab system, the slab is supported on beams. Depending on beams and columns arrangements, it can be designed for wide ranges of the load conditions. Two-way waffle slab system is used for the office buildings (low rise), parking structures, and warehouses. The two-way waffle slab is provided with a greater span as compared to the solid slab. The two-way waffle slab is economical when it is used in the modular or prefabricated form. We can assume “two-way slab action” for the design of the other slabs like two-way slab with the hollow block, waffle floor (slab with joist beams) made of the precast double-tee section, waffle floor with hollow-block or hollow-cored slabs, Two-way flat plates slab, Two-way flat slabs, and two-way waffle flat slabs. 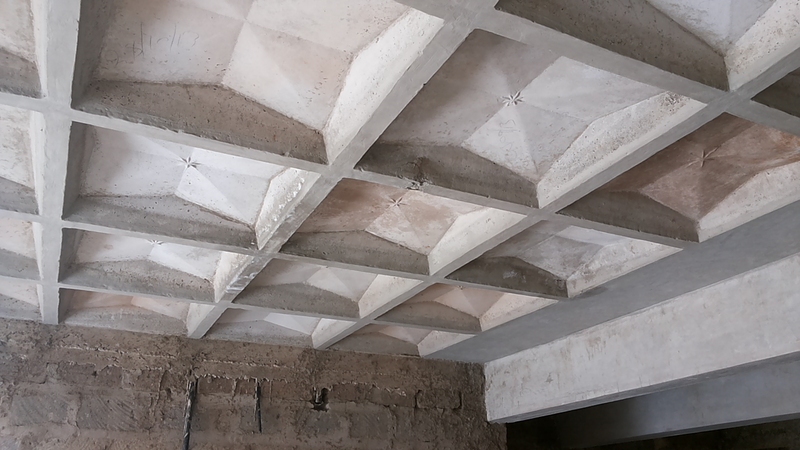 Two-way slab action is assumed in a ribbed floor (slab with joist beams) made of the precast double-tee section, in the ribbed floor with integral beams, and also in hollow-block or hollow-cored slabs. The two-way flat plate slab is simply a slab of uniform thickness directly supported on columns, and it is generally suitable for relatively light loads. Two-way flat plates can be used for span up to 8m using reinforced concrete and up to 11m with the post-tensioned system. Due to the simplicity of flat plate, it is the most economical floor system as the formwork and reinforcement work could be done easily. Two-way flat plate slabs save the time of construction and provide exposed flat ceilings with the maximum storey height. Two-way flat plates have low punching shear capacity and low stiffness for deflection. Often, beams are provided at the periphery of the slab to stiffen the free edges and to support the brick walls. They are not recommended in earthquake zones. Shear walls may be provided to resist entire lateral loads due to earthquakes, so that the flat slab with column may resist only the vertical loads. The two-way flat slabs are more suitable for the larger loads, and spans compare to the flat plates. It is because of the drop panels and/or column capitals which provides higher shear and flexural strength. Thus flat slabs are used for heavier loading and longer span. It requires less concrete, and reinforcement compared to flat plates. However, they need more formwork for capital and panels and take more time to construct than the flat plate. They are used in spans that are square or nearly square. Flat slabs may be used for span up to 10m and imposed loads up to 7 KN/m2. A slab supported on beams on all sides of each floor panel is generally referred to a two-way slab system. A waffle flat slab is equivalent to a two way joist system or may be visualized as a solid slab, and they are used to decrease the weight of slab. Waffle flat slabs have a square grid of closely spaced joists with filler panels over the columns. Similar to ordinary two-way waffle slabs, lightweight concrete blocks, on temporary or permanent shuttering, may be used in their construction and domed forms are omitted around the columns to create solid panels. The concrete in the ribs and slabs are poured integrally, creating aesthetic soffits, with up to 750 mm2 and up to 500mm deep pockets. Remember that the choice of any slabs for a particular structure will depend upon the economy, buildability, loading conditions, and the span. Slabs may have 15 to 20 % quantity of RCC in the total quantity of RCC of the building. The cost of slab may very high regarding the overall cost of the building rather than the cost of column or beam. If the two-way slab is designed for the moment and shear only, it results into smaller thickness of slab. Thus we observe vibrations on floor but it doesn’t collapse. But when the slab is designed for the moments, shear and deflection, it leads to higher thickness of slab and you get vibration free slab. Hence always design it for the moment, shear and deflection.